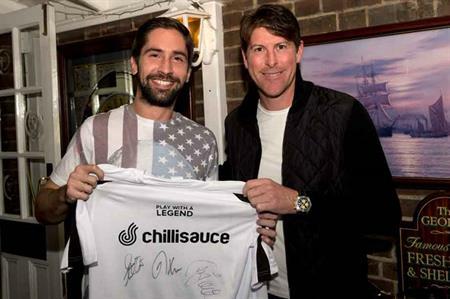 Chillisauce has launched a football teambuilding package for corporate groups, where delegates can play with Premiership legends including Teddy Sheringham and Matt le Tissier. The ‘Play With A Legend’ experience will give corporate delegates the chance to team up with one or more former Premier League stars for a five-a-side, six-a-side or 11-a-side match, with an opportunity to socialise with the stars afterwards. The games can take place in a range of venues from Powerleague pitches to major footballing stadiums around the UK, including Wembley Stadium, Emirates Stadium and Stamford Bridge. Chillisauce has partnered with former Arsenal player Perry Groves to create the teambuilding and incentive package, which has more than 50 football legends on board. Groves said: "Being a professional footballer was the best job in the world and those of us that did it feel lucky and privileged as we know it’s something millions of people dream of doing for a living. "I’ve always loved playing and I’m no different these days, so the opportunity to have a kick about with fans and tell them stories over a few drinks is something I really enjoy." Former England, Manchester United and Aston Villa striker Dion Dublin added: "After a 22-year football career, it is rewarding to be able to be given the opportunity to play alongside the public, and give them the experience of stepping over the white line with professional footballers." The package will include a choice of ex-pros to play alongside, a full football kit for each delegate, team photos and food and drinks after the match.